Top finish for nC Nano Corrosion Passivator Marine. It is a one-component surface coating suitable to apply as a hardcoat finish over nC Nano Corrosion Passivator Marine during spot repairs or full tank coating. Perma Film has a type approval certificate issued by DNVGL valid until July 31st 2017 for use in ballast water tanks (ship maintenance only). Perma film is a top finish for nC Nano Corrosion Passivator Marine. It is a one-component surface coating suitable to apply as a hardcoat finish over nC Nano Corrosion Passivator Marine during spot repairs or full tank coating. It is designed for protection of metal internal structures and will also protect metal parts, piping or machinery exposed outdoors in marine or chemical areas from corroding because of the unique nano and micro technology involved. It also can be applied over waxy surfaces that not contain solvents, sulfur or acids. The lattice structure of aluminium particles in Perma Film covalently bond into the surface during the drying process. When combined with nC Nano Corrosion Passivator, the treated metal will be perfectly cleaned out from enzymes, salts, minerals and protected by corrosion passivation (see nC Nano Corrosion Passivator product information sheet) whilst covered by a flexible hardcoat finish. Perma Film can be delivered as top finish for nC Nano Corrosion Passivator in black, grey, ochre (buff) and transparant. It is applicable by means of roller, brush or spray. Perma Film has a type approval certificate issued by DNVGL valid until July 31st 2017 for use in ballast water tanks (ship maintenance only). Prepare surface to SSPC7/NACE#$/31GP404 Type3/Sa.1 level. Pre-treat surface with nC Nano Corrosion Passivator by floating or spot treatment by means of brush, roller or spray. 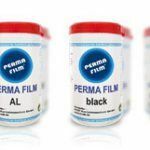 Perma Film Top Finish NCP Marine needs no field mixing and is suitable for easy application with a minimal dripping and running even when applied at very high film thickness. Cross layer-application is recommended. Perma Film can be applied over nC Nano Corrosion Passivator in one layer of 250 mm dft in one working step by cross spraying. Perma Film can be applied at low temperatures but it is not recommended to apply the coating when the substrate has a temperature below zero and white frost is forming under high humidity. Low temperatures extend curing time of the coating before exposure to water. Perma Film can be applied in a single coat over nC Nano Corrosion Passivator, as nC Nano Corrosion Passivator passivates metal and therefore makes further corrosion impossible. Single coat application over traditional primers is possible, but here the risk of the effects of pinholing will be present. The applicator should be equipped with a proper respiratory mask. When applying Perma Film from 200 ltr. 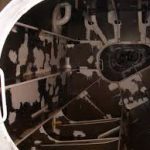 drums it is recommended to use equipment with an airless unit (above a ratio 45:1) fitted into the follow plate for ease of application. Thinning with nC Nano Corrosion Passivator is normally not required above +15 °C, however, at lower temperature small amounts (5 % or less) should be added. To reduce the viscosity before application at low temperatures the material also can be warmed up to 20 – 25 °C (e.g. overnight storage at ambient temperatures). Mechanical strength, when cured in low temperatures, is low initially, but will increase. Ventilation must be maintained during application and continue whilst solvent is released from the paint film during drying. Where nC Nano Corrosion Passivator is a bonding process, Perma Film is a physically drying paint, i.e. no chemical reaction takes place during film formation, only solvent evaporation. This paint can be applied and will dry to satisfaction regardless of temperature condition, as long as these are not extreme. The only thing that will vary with the temperature is the rate of evaporation of the solvent. Sufficient air movement i.e. 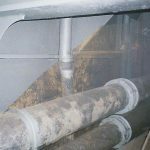 ventilation to remove the evaporating solvent away from the surface is more important for the drying rate than the temperatures. 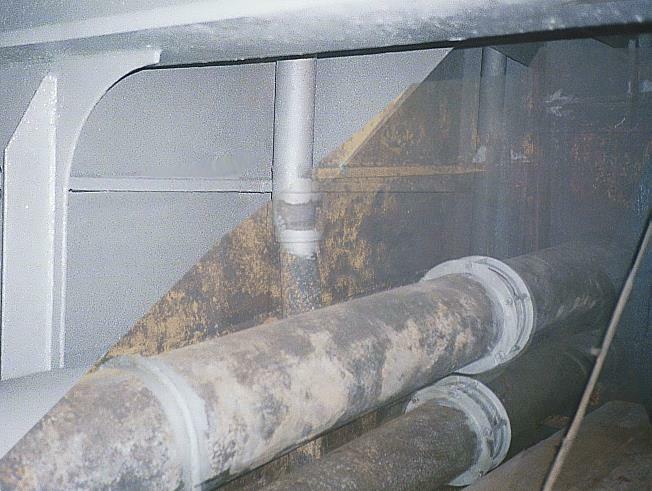 Ventilation should be provided throughout the cure period to ensure all the solvents are removed from the coating. 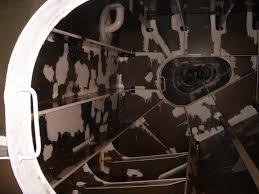 For welding and cutting in the coated area the tank should be “gas-free”, provided by measurement. Perma Film is to be handled with protective gloves and eye/face protection. This material is a paint/coating. It is not exceedingly volatile, but will easily burn. Vapours may travel to an ignition source and flash back. Ventilation: Apply in well ventilated areas. Use additional ventilation if needed to control vapour concentrations particularly if a mist is generated, or, fumes from hot material are present. Perma Film has an unlimited shelf life. Store Perma Film between temperatures of 5° Celsius and 25° Celsius. 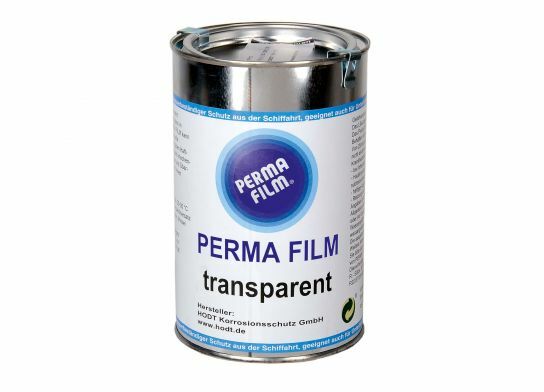 Perma Film is available in 5 liter, 20 liter, 60 liter, 208 liter and 1,000 liter packaging.